Dental imperfections such as cracks and chips can significantly impact the appearance and health of your teeth. Missing teeth and gaps may not only negatively affect your ability to eat and speak, but can also lead to more severe health problems when left untreated. Dr. Isaías Íñiguez and his team are committed to restoring the smiles of each of his patients so that they can live happier and healthier lives. Whether you are seeking a crown to strengthen a cracked tooth or if you desire a full mouth rehabilitation to rejuvenate your teeth and gums, Dr. Íñiguez can design an oral treatment plan to meet your individual needs. To schedule a consultation at Dr. Íñiguez’s office, and to learn how our restorative dentistry options can help you achieve the smile you deserve, please contact our office today. At our practice we can provide restorations that are made from the most advanced materials available, including zirconia. ZIrconia offers unparalleled strength, esthetics, and bio-compatibility, in addition to allowing us to perform more conservative tooth preparations. Whether you are in need of a traditional or implant-supported crown, bridge, or denture, we can design, customize, and create a superior restoration that can be long-lasting and natural-looking. We partner with advanced dental labs that are experienced in the latest fabrication techniques and work with premium materials. We our proud to say our practice in Mexico offers this level of exceptional dental work performed by a highly skilled team of dentists. If you have missing teeth and are seeking an alternative to traditional dentures, dental implants can provide you with a permanent solution. Using an artificial titanium root and a customized porcelain replacement tooth, dental implants can offer unsurpassed strength and stability. This state-of-the-art restorative dentistry procedure can give you results that both look and feel natural, as well as a beautiful smile that lasts a lifetime. Implant supported dentures utilize the stability of dental implants to anchor your dentures into place for a more secure fit. Traditional dentures have a tendency to slip along the gumline, cause irritation, and impair the ability to eat and speak with ease. By first strategically placing a select number of dental implants, the denture can then be fastened into position. As a result, these innovative dentures eliminate the need for messy gels or adhesives. In addition, implant supported dentures are custom-designed for your mouth to provide you with improved comfort and a more natural aesthetic. Implant supported dentures may also be ideal for patients who seek an alternative to traditional dentures but who are not candidates for a full set of dental implants. After your treatments are complete, you can enjoy a healthier, natural-looking, youthful smile. Many patients find that full mouth rehabilitation not only dramatically changes their appearance, but also improves their day-to-day quality of life while providing a boost of confidence. Designed to top a dental implant or fit over damaged teeth like a cap, dental crowns can help restore both function and esthetics to your smile. Our dental crowns are handcrafted to match the shape and shade of your natural teeth, and the results can last for decades with the proper care. If you have a tooth that is broken, worn, decayed, or discolored, a dental crown may be the right solution for improving its appearance and health. 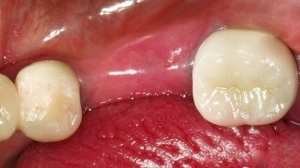 Fixed Partial Dentures: A bridge that is permanently affixed to a set of dental implants or adjacent teeth for increased stability. Traditional Bridge: A bridge secured into place with a crown on either side of the missing tooth or teeth. Cantilever Bridge: A bridge secured into place using only one tooth. 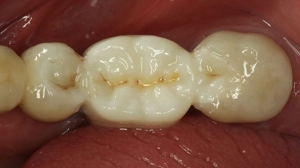 Resin-Bonded Bridge: A bridge bonded to the teeth with the assistance of metal wings. During the consultation process, Dr. Íñiguez will help you choose a bridge type that can best achieve your goals.